Brand new, direct from Benchmade out in Oregon, the 908 AXIS Strykers are the newest variations of this awesome tactical folder. The 154CM steel drop point style blade has dual thumb studs to complement the AXIS lock and reversible tip-up carry pocket clip – making this knife truly ambidextrous. The new textured G10 handle features a different grooving pattern, but still provides excellent purchase in any grip in almost any conditions. 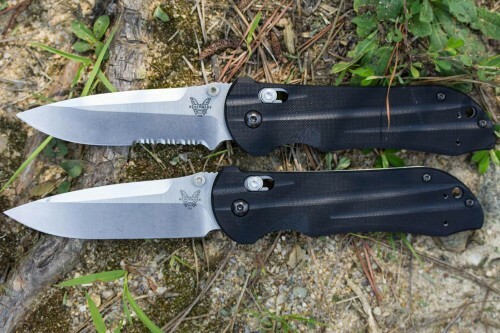 Benchmade, as always, delivers another first class design with these new Strykers – now with deep carry pocket clips. 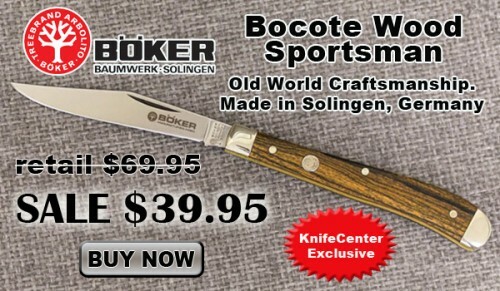 See them now at www.knifecenter.com. 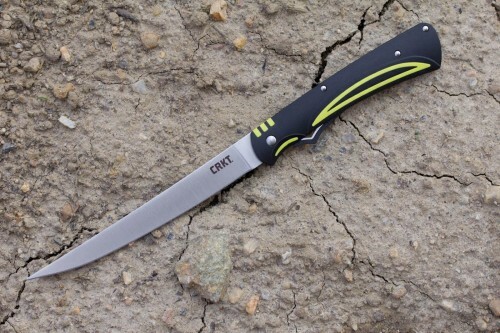 CRKT Ken Steigerwalt’s Clark Fork is a must have for fisherman of any level. With a long, flexible stainless steel blade and glass reinforced nylon handle – it makes for extremely easy cleaning of both fish and the knife once you’re finished. Big enough for filleting nearly any sized catch but once folded, compact enough to fit in smaller tackle boxes. Includes a black nylon sheath for safe storage on your person in the open position. See more details at www.knifecenter.com. 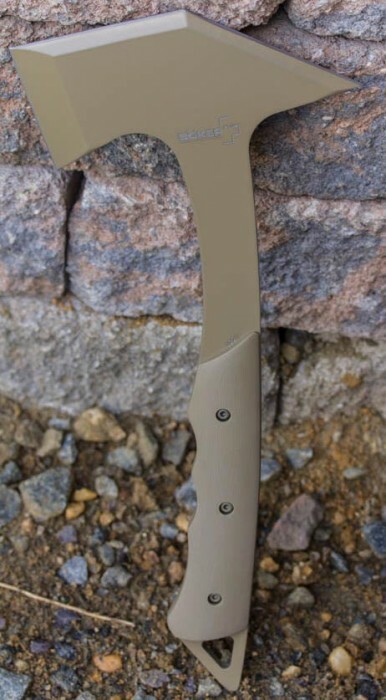 The TFF-1 Tactical Fighting Folder is an absolute monster of a knife developed for military & law enforcement personnel. It’s a big, beefy blade that you 100% can count on whenever you might need it and whatever you may need it for. The handle is made with a solid titanium frame lock and your choice from a variety of G10 face scales. 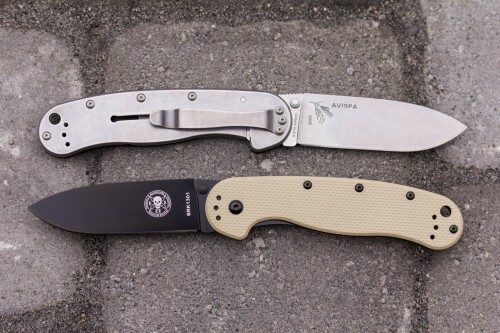 The tip-up carry pocket clip is sized appropriately for this folder and is extremely strong. The wide, spear point blade is made from 0.19″ thick D2 steel with a black oxide finish and a hollow grind. The TFF-1 is an ambidextrous one-hand opener and built entirely in the USA. 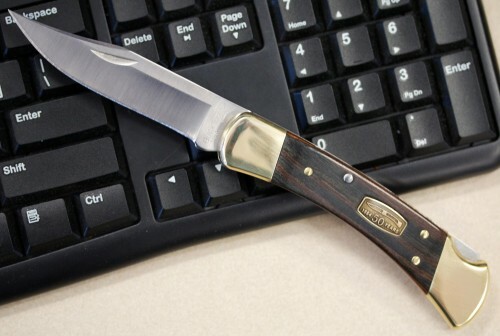 It is up to just about any challenge, check it out at www.knifecenter.com. What are you carrying today? I have my good old Buck 110 Hunter. 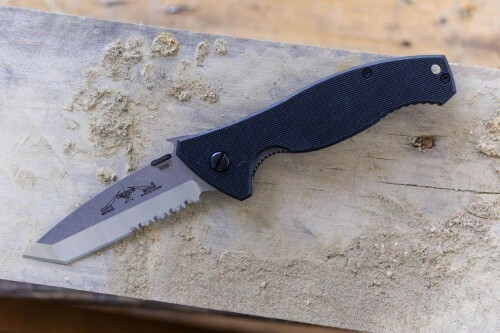 Designed by the survival experts over at ESEE Knives, Mike Perrin and Jeff Randall, and produced by Blue Ridge Knives, the Avispa is a hybrid between the Ontario RAT handle combined with the blade style of the Zancudo folder. Compared to the Zancudo, it features a larger, more capable 3.5″ blade for better cutting power. 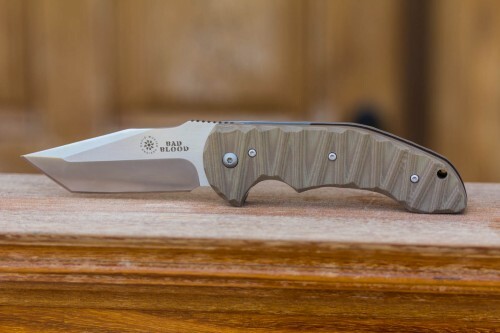 Features a nice, slim design with a full-size blade in stonewash or black. Handles are textured FRN (Fiberglass Reinforced Nylon) in the front with a stainless steel back. The framelock lockup feels solid and the blade easily glides open using the dual-thumb stubs. The Avispa will surely appeal to many with its 4-way pocket clip making it 100% ambidextrous. Overall, this is a great choice for an EDC for anyone looking for a high quality, full-size folder not looking to break the bank. See all models at www.knifecenter.com. I was pleasantly surprised when unboxing the new Bad Blood Cross Fire Tanto. This reminds me alot of some other knives by popular manufacturers for a fraction of the price. The fit and finish done on the textured G10 handles are just exceptional. The grooved handles feel formed-fitted and feel very natural and secure while the flipper makes it very easy to quickly deploy your blade. Most of the knives I carry are set tip-down (personal preference) so may take a little getting used to the tip-up only pocket clip. However, with the design and value of this knife, it’s definitely not a deal breaker. This is a knife you can count on day in and day out. For more info to www.knifecenter.com. 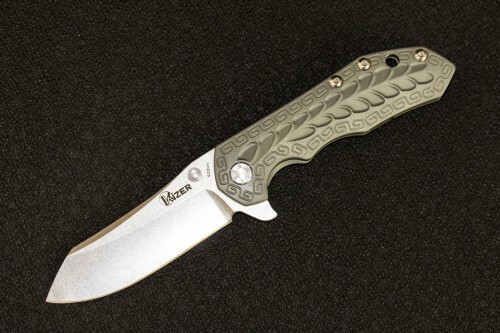 The design on the handle of the Kizer Ki4423 is a work of art…literally. The designer (Kim Ning) incorporated two important Ancient Chinese Symbols: “Ling Zi (Pheasant Tail)” and “Hui ZhuanLun (Gyroscopewheel)” inspired by a treasured Chinese sword. It has probably the smoothest opening action of any knife I’ve ever seen, probably because it is made entirely by hand. The fit, finish, buttery smooth action, razor sharpness, and materials are exactly what you look for in a knife twice this price. 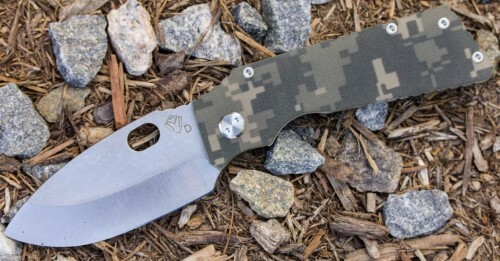 The new 4423 from Kizer is a knife you must handle to appreciate just how nice it really is, check it out at www.knifecenter.com.